If you are using an Intel® vPro server, purchase a Deluxe SSL certificate and specify that it is for vPro during the application process. Note: If you do not see the option to purchase a Deluxe SSL, contact customer support. 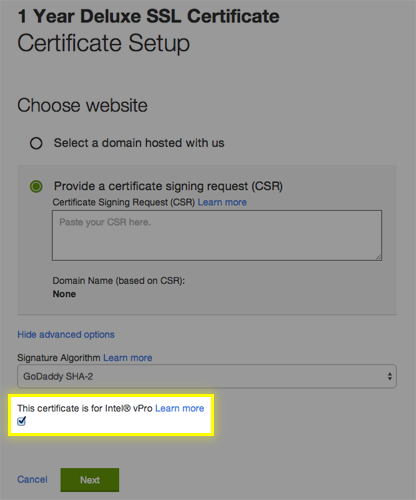 Single Domain for a single domain environment. Single Domains with Unlimited Subdomains (wildcards are supported for AMT 2.6 / 3.2 and higher). Before you apply for the certificate you must first generate and submit a Certificate Signing Request (CSR). Your Web server software generates the CSR and creates the public/private key pair that you will use to encrypt and decrypt secure transactions. Note: It is not necessary to specify a department or organizational unit (OU) when generating a CSR. For more information, see CSR Generation Instructions. During the application process, specify that this certificate is for use with Intel vPro. This selection adds the required Intel vPro provision to your certificate. After your application is approved, you'll need to download your certificate files. When selecting your server type, select Other. The bundle of files this downloads includes an intermediate and a cross certificate; you must install both of these to ensure your certificate works properly. After downloading the bundle, see Install SSL certificates.